Everyone can learn to play an instrument, but there are no mystical shortcuts, no magic bullets. The best way to improve and fulfil your dream is to practise. That is a fact. Now practice is often difficult & tedious, so we decided to make it easy and fun. 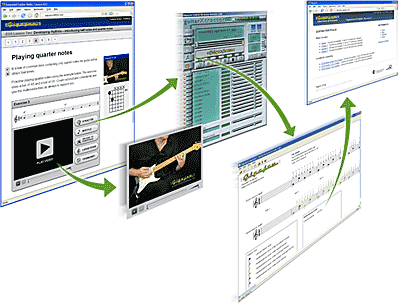 Our interlinked courses for Guitar, Bass, Keyboard and Drums are driven by our Xtractor practice engine software. With Xtractor your practice sessions become more focused and more fun. It's so simple, learning with Gigajam is performance based. The step-by-step instructions don't ramble on. Each exercise has a tutorial video, showing your what to do, Xtractor then provides a backing band for every exercise. So you aren't just sitting there playing by yourself, you are always putting into practice the things you have just read about, listened to and seen. Truly interactive. As an added bonus, with a MIDI instrument Xtractor recording & analysis can show you graphically where you are going wrong, where you need to improve, and where to target more practice. You learn at your pace in your own space, without leaving gaps in your knowledge, and with the confidence to take your skills to the next level based on the strong feedback that Xtractor gives you. You'll be sounding great in no time. Don't forget, all the courses are interlinked, while you're learning one instrument three friends can be learning the others, and you've got yourselves a band! Have a look at our sample lessons.